Výfuk je navržen a upraven pro snížený podvozek (jediný v nabídce) a je určen pro rychlé motory. Celý je vyroben z nerezové oceli 100% AISI 304. Konstruován je tak, aby nebyl výfuk vidět, pouze koncovka, která je leštěná (vysoký lesk). Kromě toho má další pozoruhodné vlastnosti, které nemá žádný jiný výfuk - trubky jsou ohebné a nastavitelné (síla příruby 4 mm), proto je vhodný pro všehcny motory Typ 1 od standardních až po sportovní motory (výkon až 125 HP). Na obou stranách jsou připraveny otvory M8 x 1.5 mm pro montáž lambda sondy. Svody s průměrem trubek 38 mm pro lepší proudění výfukových plynů, ale bez předehřevu pro karburátory. Pokud má být zapojeno topení na výměníky tepla, je nutné použít pouze hliníkové trubky, které se natvarují podle potřeby. 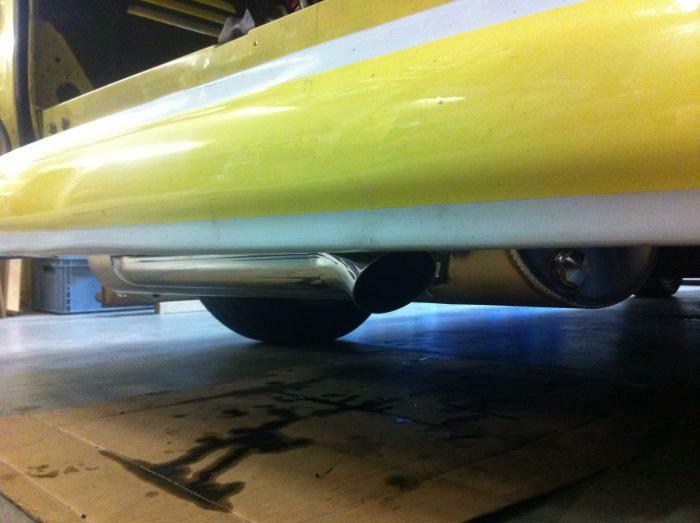 Lowered Bus exhaust Stainless Steel. When there are extremely low, many problems around the corner where a solution must be found, and especially if there also a fast engine is hung. A quick engine requires a modified exhaust system and that is not easy at extremely reduced Bus and certainly not if you want to keep. The exhaust out of sight Especially for the Spijlbus this " Lowered Bus "designed exhaust, there is no other exhaust system with more ground clearance which is also suitable for both the original and the tuned engine. The entire exhaust is manufactured from stainless steel, and so constructed that it is virtually out of sight, and if you bother to look underneath the power tube also further polished. Besides these advantages offer the " Lowered Bus "even more remarkable properties that no other exhaust system in this class can deliver. - the flanges are per side 4 mm adjustable, therefore suitable for all type 1 engines from standard to large stroke engines. - provide a sport muffler which is capable of a power output of 125 HP - 100% manufactured from AISI 304 stainless steel. - with two M18 x1.5 connections for mounting lambda probe sensors. - with a fiberglass shell around the exhaust pipe to protect the heater hoses. fits perfectly with the original stove pots using the - original mounting hardware (not included, see options). - header pipes with a pipe diameter of 38 mm for a better flow. - no carburetor preheat (or as an option) intended for sideway mounted carburetors Comes complete with gaskets and mounting material which are intended only for mounting the outlet itself, the mounting hardware designed for the heat exchanger or heat exchanger replacement is not supplied, take this there any extra at (see options). It is also necessary for the heater hose directly onto the heat exchanger to connect, use this only aluminum tubing, the original paper tube is not up to the heat of the exhaust pipe where it runs along. applicable in all Buses t / m 7/1967 provided of a type 1 engine # 23244.